You can select and control the maximum number of panelists for each time slot! When a time slot fills up it will become grayed out and unavailable. Panelist Recruitment, Custom Fields and Scheduling. What is PAN_CUSTOM Special Ballot? 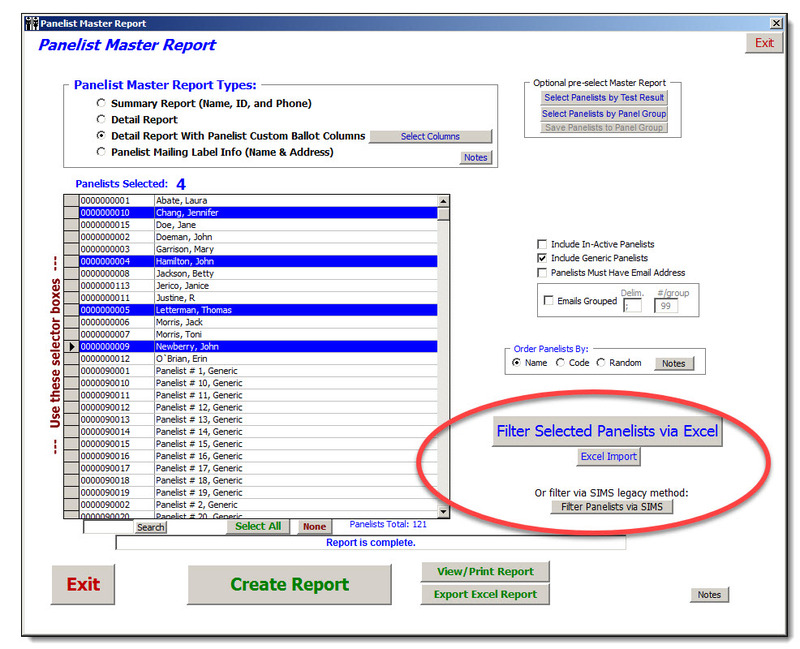 PAN_CUSTOM is a special ballot in SIMS and is the NEW and IMPROVED Official way to manage your PANELIST CUSTOM information. PAN_CUSTOM test execution is normal a SIMS Result code and test just any of your other tests. You can Start the test and End the test any time you like. You might already have a starter PAN_CUSTOM special ballot in your SIMS questionnaire area, check it out. Contact SIMS for more information. One & done consumer participants should not be added as 'panelists' per se in your SIMS system. Especially for your SIMS online tests. One & done consumer participants should be handled as 'Anonymous' participants, while getting any needed identifying information via your open-ended comment responses. 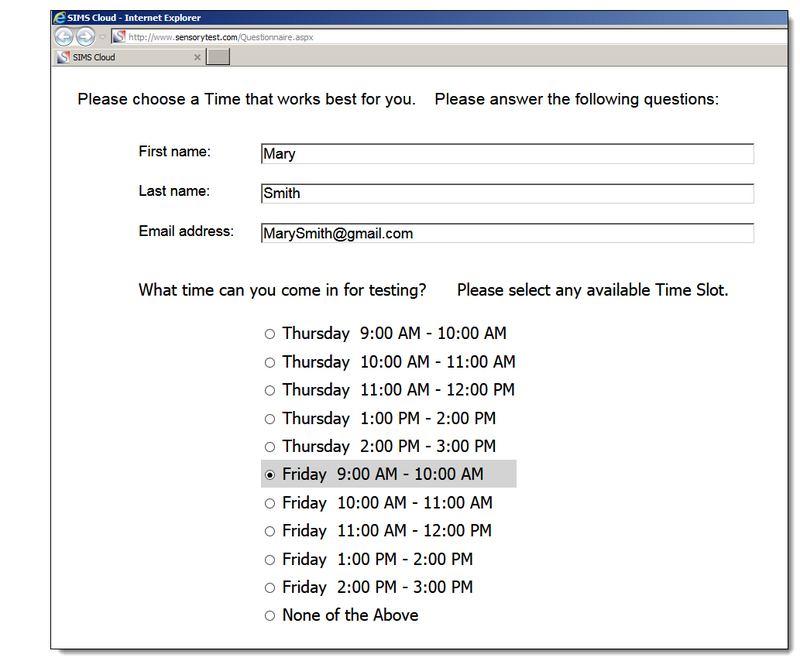 Only your repeatable participants should be added into your SIMS Panelist database areas. Do you have a SIMS Ballot named PAN_CUSTOM ? If not contact SIMS and they'll get you started. Special SIMS Experimental Design named PAN_CUSTOM. One sample design. Not modifiable. The code 'PAN_CUSTOM' is reserved and may not be edited. Special SIMS Test Definition named PAN_CUSTOM. Not modifiable. The code 'PAN_CUSTOM' is reserved and may not be edited. Special SIMS Test Execution named PAN_CUSTOM. Not modifiable. The code 'PAN_CUSTOM' is reserved and may not be edited. Technician can stop & start the PAN_CUSTOM Test anytime as needed. Any room test execution is allowed. Panelists and retake the ballot over and over again as needed. All editing activity is immediately logged and audited in the SIMS system, every action is logged immediately in real time. 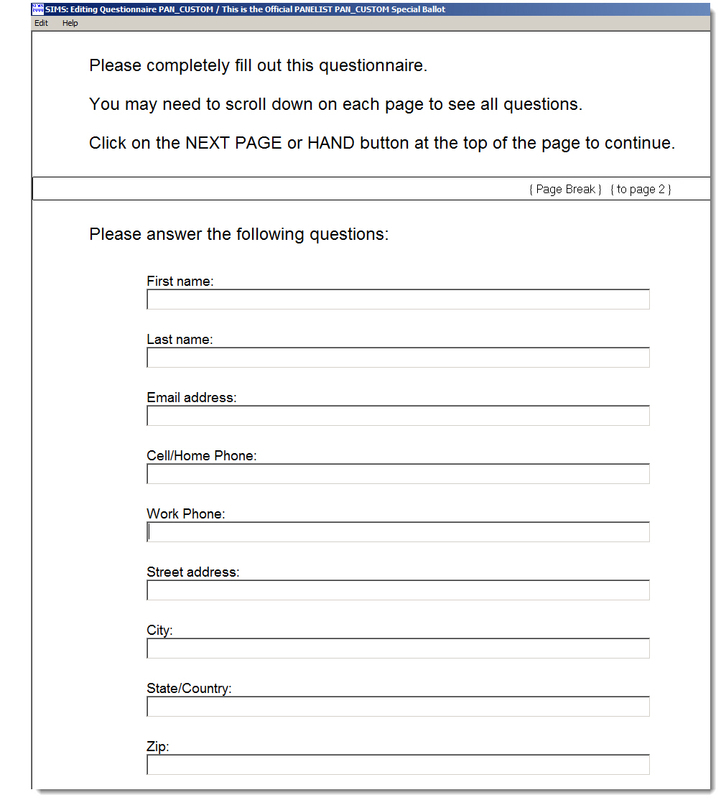 Adding questions in your PAN_CUSTOM ballot. Adding questions is safe and will not impact any existing panelist data already collected. QUESTION TYPES allowed are Comments, Hedonics, Line Scales, Yes/No, All That Apply and Grouped Intensity. 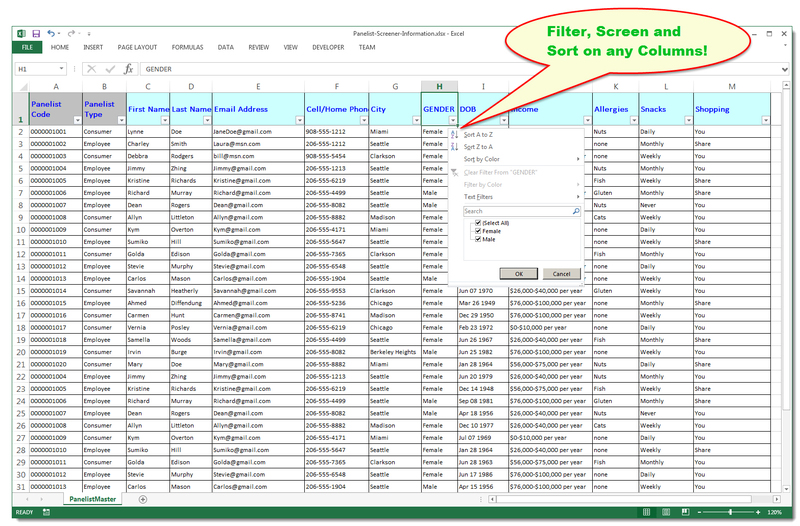 Attributes seen with ALL Samples or Sample 1 will work perfect. This is by design. If you want to RETIRE or HIDE a question without deleting it, it's easy, simply change 'Attribute Seen With' to something like Sample 99, panelists will no longer see it. Deleting questions in PAN_CUSTOM ballot. If you delete a question, the PANELIST Data for that question will also be deleted!! Proceed with caution !! Editing PAN_CUSTOM ballot questions, especially multiple choice question types HEDONIC and ALL THAT APPLY and GROUPED INTENSITY. WARNING:  Editing question types HEDONIC and ALL THAT APPLY and GROUPED INTENSITY requires some careful CARE and planning. Will your editing changes impact any existing panelist data already collected? Data integrity can be complicated. Example Problem:  You want to change a Category Hedonic, you want to eliminate/swap/move categories, what happens to panelists who have responded already to the question? These are real complex data issues. Your partners at SIMS will help you handle these modifications on a case by case basic. CALL SIMS. So for now, SIMS can not ALLOW editing under the [choices] tab if panelist data exists. Please CALL SIMS for assistance. SYNC automatically to/from your PAN_CUSTOM Ballot Test and to/from your SIMS Panelist Master database. Attribute Export Label Names - Special Cases for SYNC'ing. Enabling SYNC'ing - These "Export Label Names" need to be exactly as shown below. SIMS will SYNC automatically to/from your PAN_CUSTOM Ballot Test and to/from your SIMS Panelist Master database. We will add to this list as needed. Simply start your PAN_CUSTOM SIMS test just like any other SIMS Test. Your panelists sign-in with their existing paneist_code and complete the ballot. Raw Data Exporting Reports, any SIMS test, optionally add columns from your PAN_CUSTOM ballot data matched by Panelist Code. 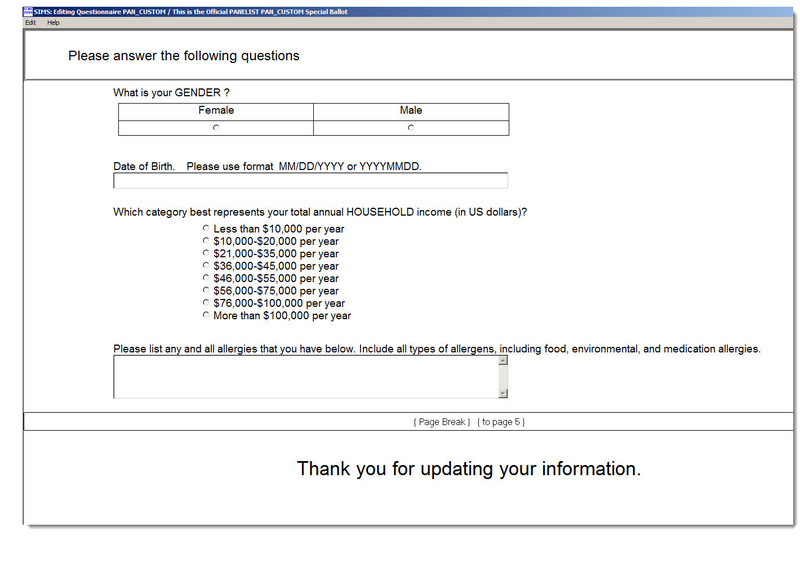 As always, we recommend you "test-your-test" like you should with any other SIMS ballot. More protection from technician editing existing PAN_CUSTOM Ballot questions when panelist data already exists. Protect the data. Anonymous and/or new panelists, ability to add previously unknown panelists on the fly as new panelists. 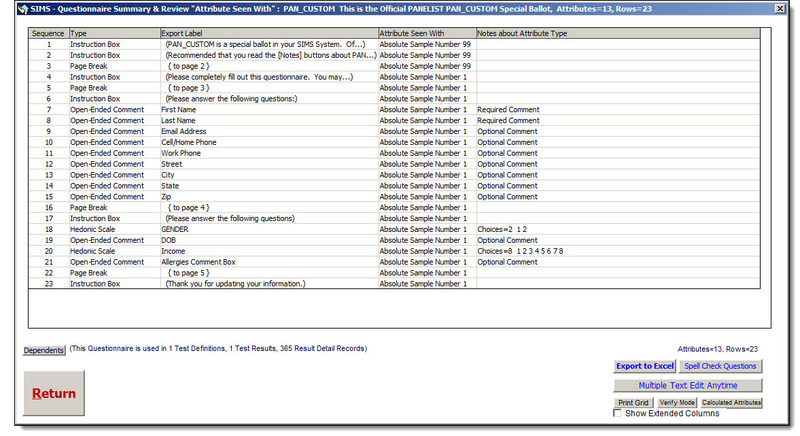 Ability to PIPE individual answers into PAN_CUSTOM from any of your other SIMS Test's attributes and questions.